People watch as a crane lowers the VolturnUS 1:8 unit into the water of the Penobscot River at the Cianbro Corporation Brewer facility in May. AUGUSTA, Maine — Maine Aqua Ventus, a consortium led by the University of Maine, has released additional details about its 12-megawatt, full-scale pilot floating wind turbine, but key factors such as cost, projected job creation and economic impact are still confidential. When the project was submitted for the approval of the Maine Public Utilities Commission in September, it was marked confidential, but the PUC last month ruled that Maine Aqua Ventus must release all segregable aspects of the plan for public review, thanks largely to the fact that so much of UMaine’s wind efforts had already been publicized. Details protected as “trade secrets” include the cost of the project, the proposed rate to be paid by energy consumers, the projected number of jobs to be created and the projected economic impact. That information won’t be made public unless the PUC and Maine Aqua Ventus agree on a term sheet, which would outline the conditions under which public utilities in Maine would buy energy from the company. However, there was some information made available publicly for the first time. The proposal outlines the plan for Maine Aqua Ventus I, a two-turbine wind tower on a floating concrete base tethered 2½ miles off the coast of Monhegan Island. The 270-foot-tall advanced composite tower will feature two 6-megawatt turbines, and will be built using UMaine’s VolturnUS technology. 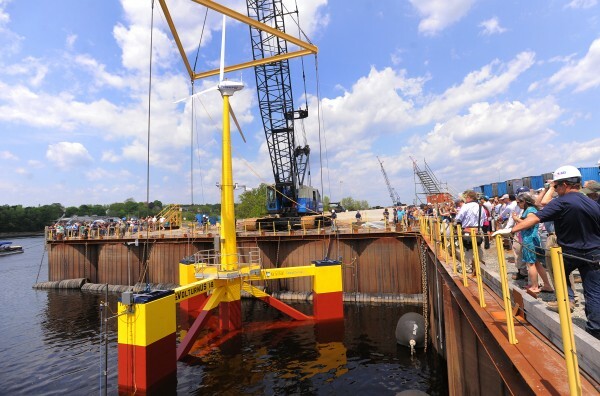 The project is the next step in the development of UMaine’s offshore wind capabilities, which recently led to a 1:8-scale model of VolturnUS being deployed in the water in Castine Harbor since May. Maine Aqua Ventus I would be a pilot for the future development of a 500-megawatt offshore wind farm project in the Gulf of Maine, and possibly elsewhere. The goal is to achieve wind-generated electricity at 10 cents per kilowatt-hour by the 2030s. Also spelled out in detail are plans to provide free electricity to the residents of Monhegan Island, who pay among the highest energy rates in the country for power created by diesel generators. From Monhegan, a cable would transmit electricity 10 miles to the mainland to a substation in Bristol. That cable also would provide high-speed Internet to the island for the first time. The document submitted to the PUC for the first time reveals the full list of nearly 30 companies and institutions involved in the project. The three key players are the University of Maine, Cianbro Corp. and Emera Inc. Others include Iberdrola, the Spanish energy giant that owns Central Maine Power; Technip, a French energy company involved with Hywind, the first floating wind turbine hull in the world; and SGC Engineering, an Orono company involved in connecting more than 50 percent of United Kingdom offshore wind projects to Great Britain. Other Maine partners include Maine Maritime Academy, Gulf of Maine Research Institute, HDR/DTA of Portland and the Maine Ocean and Wind Industry Initiative. Despite the myriad national and international groups associated with the project, the proposal outlines a Maine-centric design, engineering, testing and construction plan, with leadership at all stages based in the state, and construction expected to take place in Maine ports. The University of Maine already has received $4 million in federal Department of Energy funding for the development of VolturnUS. Maine Aqua Ventus is one of six applicants vying for an additional $46.6 million to fund the development of offshore wind technology. A successfully negotiated contract with the PUC is expected to help Maine Aqua Ventus compete for that money. The group also says it has a competitive advantage over the other offshore wind energy developers because of the participation and leadership of UMaine. “The UMaine-led Consortium is also the only research university-led consortium bidding for the DOE award, which is significant since the program guidelines cite involvement of research universities as a key selection criterion,” the proposal states. In 2010, the Maine Legislature enacted legislation that enabled the PUC to conduct a competitive bid process for long-term offshore wind project development. At the time of the initial bid process, the VolturnUS project was not far enough along for the university to compete. But in June, the Legislature approved a bill by Gov. Paul LePage to reopen the process to allow UMaine to get involved. According to the PUC request for proposals, the term of the contract could be up to 20 years. When the first legislation passed, it resulted in the approval of a Statoil North America plan to build a pilot 12-megawatt, four-turbine floating wind farm 10 miles off Boothbay Harbor. In October, Statoil packed up its $120 million proposal and went home, citing uncertainty created by political interference in the process. The PUC and Maine Aqua Ventus are expected to reach a deal on a term sheet by year’s end.